Do you have a tooth that will just not stop hurting? If so, then a root canal might be exactly what you need. If this makes you want to just ignore your toothache and hope for the best, then know that this procedure’s dubious reputation is actually quite undeserved. 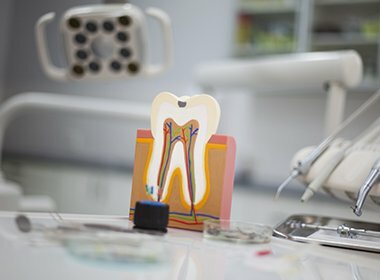 Thanks to the latest dental technology and techniques used by Dr. Salivonchik, a root canal is now a safe and comfortable way to relieve severe dental pain and save teeth that would otherwise need to be extracted. Why Choose S. John Salivonchik, D.M.D., P.C. for Root Canals? Your teeth are actually made up of different layers, and the innermost one is called the pulp, which includes a number of blood vessels as well as the delicate nerve of the tooth. When bacteria is able to reach and infect the pulp, it can cause a severe toothache. In the past, teeth with this kind of damage would just be removed, but now with a root canal, Dr. Salivonchik can help your smile stay healthy and whole while getting rid of your pain. Dr. Salivonchik will numb your hurting tooth. He’ll create a small hole in the enamel so he can access and remove the diseased pulp. He’ll clean the tooth and fill it with a biocompatible material. At a follow-up appointment, he’ll further restore it with a custom-made dental crown. 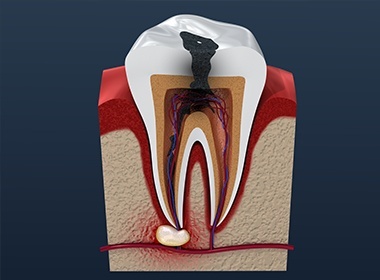 Afterward, a root canal treated tooth can be expected to look/function normally for years to come. Many of our patients say that this treatment is no more painful than getting a small filling!